Henry IV (1050-1106) - Early German monarch and Holy Roman Emperor who is most famous for being involved in the Investiture Controversy. Up until the time of Henry IV, the Pope was considered the ultimate religious authority in Western Europe. Even kings were expected to submit to him on spiritual matters. However, the German states in the north generally exercised greater independence from the Catholic Church than most of the rest of Europe. The Holy Roman Emperor appointed bishops and abbots within his realm with little interference from Rome. The sitting Pope during Henry's early reign was Gregory VII, and he was becoming increasingly concerned over the emperor's growing influence. So Gregory attempted to reassert his authority over clerical appointments in Henry's jurisdiction. The confrontation came to a head in 1075 when the Pope issued the Dictatus papae which, amongst other things, decreed that the Pope alone had the power to "depose and reinstate bishops", and "that it may be permitted to him to depose emperors". Henry responded defiantly by appointing his court chaplain, Tedaldo, archbishop of Milan (then a part of the Holy Roman Empire). Gregory's response was to dispatch a letter to the emperor (essentially a letter of reprimand) warning of the dangers of disobeying the Pope's word. In it, he compared Henry's actions to those of King Saul of Israel after he had ignored the word of the prophet Samuel. This incensed Henry, who as Holy Roman Emperor claimed the right to depose the Pope, and did so in January of 1076, backed by 26 bishops within his empire. In his place he nominated Clement III to be the new Pope. Gregory never officially left his seat, and history now remembers Clement as an Antipope. The feud became a contest of escalations, because upon hearing that he had been deposed, Gregory excommunicated Henry (twice as a matter of fact). Apparently, the Pope's order had greater effect because German princes gathered in Tribur later that year to discuss a successor to Henry. 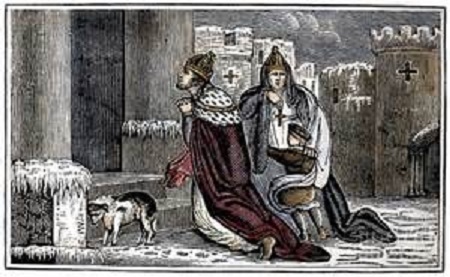 Fearing reprisal, Henry crossed the Alps and met with Pope Gregory in Canossa in January of 1077, seeking conciliation. In exchange for doing penance, Gregory lifted the excommunication order. But in the interim, German nobles proclaimed Rudolf of Swabia the new king (now considered an Antiking). This began the Great Saxon Revolt. It ended in 1080 at the Battle of Elster. Henry IV actually lost the battle, but Rudolf was killed in the fighting. With his rival dead, Henry retained the crown by default. He would reign for another quarter century until he was forced by his sons to abdicate in 1105.